Trying to be very patient these days as there are NO signs of spring in our neck of the woods. Husband and I have searched several times....nada. So I filled the house with daffodils. The second amaryllis that was planted in mid November finally bloomed. It is a white with delicate red edges, very pretty and a much preferred shorter height. It is a Hippeastrum Picatee amaryllis. 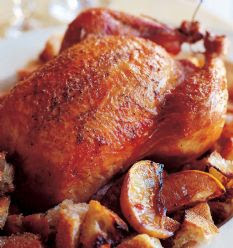 Made Ina's Lemon Roasted Chicken from her Barefoot in Paris cookbook. Same way I have always made roasted chicken, just rub butter or olive oil onto the skin, lots of salt and pepper and stuff the cavity with lemons. I left out the yummy croutons that are part of her recipe. The best part of a roasted chicken is the creative meals that come from it for the next few days with the leftover. After making chicken broth in the traditional way with the carcass, I made a Mexican soup with the freshly made stock, leftover diced chicken, black beans, corn, sauteed diced red pepper and red onions, cumin, chili powder and cayenne pepper. Topped it off with half and half that I whipped a bit, at the end off the heat. Really delicious, the two men in my house loved it! Still had chicken so made Sophie Conran's Chicken and Leek Pie recipe. Very simple to make, dinner was ready in 40 minutes, another man pleaser! Temps have been in the twenties all week so still into the comfort food. I have been continuing with my Annie Sloan chalk paining/lessen the amount of brown furniture in the house campaign I have been on. 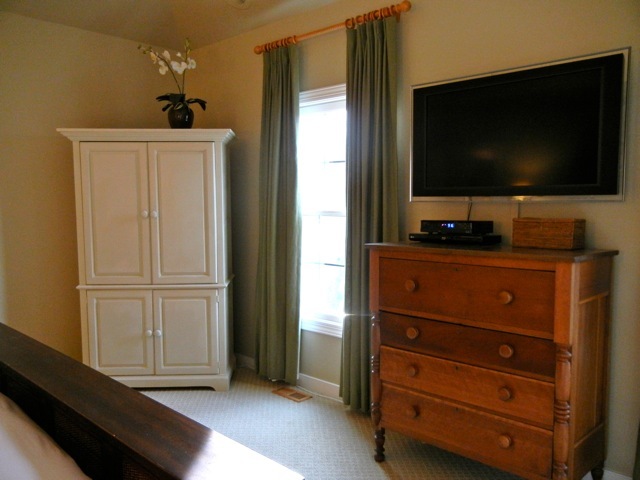 I painted the country dresser in our bedroom that sits under the television yellow, actually a soft gold called Arles. Also had the handyman install wood blinds from Overstock (this room photographs terribly from the glare). After researching the value of similar pieces online, I decided it was fine to paint the dresser. This style of furniture is not popular, the similar dressers I found had not been bid on in online auctions and ours has a crack in it on the side so any value it had has been diminished. Also painted the sunburst yellow to bring some color to opposite wall. Have not distressed it yet, will let some gold show through. My fiddle leaf fig cutting just sprouted a new layer of growth! It seems to be happy. Can you tell what these are? Swimsuits and coverups! Just tried them on, I have to be in them in less than 3 weeks!!!! We are heading to Mexico with teenagers and families for our son's last high school spring break. Husband and I are attempting to get rid of the winter weight quickly. No more comfort food.... light soups, salads and lots of dog walks and exercise. Wish us luck, we need it! What's going on in your house this week? Hello Cindy, Maybe early March is too early to expect spring in Northern Ohio, but inside your house looks all spring and sunshine. All three of those chicken dishes look absolutely delicious. I just made gumbo for some friends last weekend, but made it vegetarian--no chicken this time.